Dean Boyd completes his hat-trick from the penalty spot as Battle Baptists see off St Albans Romans 5-0. A Dean Boyd hat-trick and a Josh Pickering brace ensured Battle Baptist Football Club began its defence of the National Christian Cup in perfect style. The Macron East Sussex Football League leaders triumphed 5-0 away to St Albans Romans in a third round tie played in the worst of wintry weather on Saturday. Six points clear at the top of the Herts and Borders Christian League, Romans began in confident mood, having progressed to the last eight of the Hertfordshire County Cup a week earlier. Nothing suggested that the game would end so comfortably for Battle, who travelled with four regulars missing from their squad. Battle started with a strong wind behind and with the sloping pitch in their favour, and Boyd lit the fuse in only the second minute. Adam Staplehurst slotted a fine pass in behind the Roman defence and Boyd calmly clipped his shot over the onrushing goalkeeper. After a succession of corners had pinned the Romans inside their own penalty area, Boyd doubled Battle’s lead by using the wind to maximum effect to score directly from yet another corner kick. While the visitors applied intense pressure, St Albans attempted to keep possession and move upfield, but typically lost the ball after two or three passes, with Trystan Mayhew and Dale Vinall snapping at their heels in central midfield. 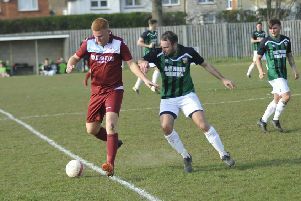 Joe Brister weaved a skilful path through the opposition midfield and defence only to see his goalbound shot tipped round the post by the diving goalkeeper. Romans were certainly happy to come in just two goals down at the break. Fearing a Roman onslaught in the second half, Battle steeled themselves to defend against the wind. But the home team never threatened Jake Rudwick’s goal thanks to stubborn defending by the impressive Battle back four of Ian Rafati, Tom Saunders, Sam Loughman and Harry Loates. The competition rules allow Repeated Replacement Substitutions (roll-on, roll-off subs), but neither team felt it necessary to disrupt their line-ups unduly, until Pickering replaced the impressively talented Tom Cann at number nine. The all-important third goal came shortly afterwards when Pickering was on hand to tap into an empty net following a catastrophic mix-up between the home centre-half and goalkeeper. The nature of the goal added insult to injury and now the Romans began to look defeated. Any further doubt was extinguished when Boyd set up Pickering for the fourth goal, which was clinically dispatched by the striker. Battle made a second substitution, calling on the fresh legs of Josh Reuter to add renewed energy to the midfield. The replacement created space and almost notched a goal as gaps appeared in the Roman defence. When Staplehurst was felled for a penalty close to the end, captain-for-the-day and midfield talisman Vinall, who normally takes penalties, generously handed the ball to Medica man of the match Boyd to complete his treble with a neatly taken spot-kick. The astonishing result brought glee to the saturated Battle faithful and the prospect of a quarter-final away to Selhurst United (SE London) or FC Cornerstone (Stevenage) on Saturday February 24. Weather permitting, Battle will return to league action tomorrow (Saturday) at home to Sedlescombe Rangers.